Sharon Thesen grew up in small towns across Western Canada. After graduating from Prince George Senior Secondary in 1963, she moved to Vancouver and worked as a secretary at CKWX radio station. At Simon Fraser University, she studied poetry with Robin Blaser, George Bowering, and Ralph Maud; and in 1975 began teaching English and Creative Writing at Capilano College (now University) in North Vancouver. In 2005 she joined UBC Okanagan's Faculty of Creative and Critical Studies as Professor of Creative Writing. Oyama Pink Shale, The Good Bacteria, and A Pair of Scissors (Anansi) are her most recent poetry books. Earlier books include two selected poems, The Pangs of Sunday and News & Smoke, and several titles from the 1980's and 90's from Coach House Press in Toronto. Sharon has been involved in the Canadian and Vancouver poetry scene for many years. 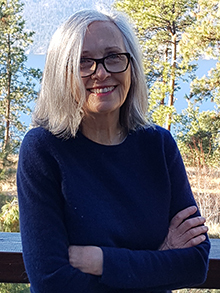 As an editor, she has published two editions of The New Long Poem Anthology, a Governor-General's Award-winning edition of Phyllis Webb's poetry (The Vision Tree), and, from 2001 to 2005, edited The Capilano Review. She co-edited, with the late Ralph Maud, two editions of correspondence between the American poet Charles Olson and book designer Frances Boldereff (Charles Olson and Frances Boldereff: A Modern Correspondence) (Wesleyan University Press, 1999) and After Completion: The Later Letters (Talon Books, 2014). For both editions, she wrote extensive introductions. 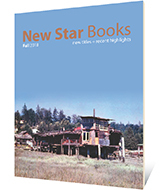 More recently, she wrote an introduction to George Stanley's selected poems, North of California St. (New Star, 2014). She also co-edited, with Nancy Holmes, Lake: a journal of arts and environment, which was housed in the Faculty of Creative and Critical Studies at UBC's Okanagan campus. Sharon's book of poems A Pair of Scissors won the Pat Lowther Memorial Award. The Good Bacteria was a finalist for the Governor-General's Award, the ReLit Award, and the Dorothy Livesay Prize; Oyama Pink Shale was a finalist for the Dorothy Livesay Prize. Two earlier books also were finalists for the Governor-General's Award, and in 2002 Sharon was a member of the jury, along with American poet Sharon Olds and Irish poet Michael Longley, for the Griffin Prize for Excellence in Poetry. Sharon has published essays in The Vancouver Review, Dooney?s Cafe (online), Dispatches (online), Brick magazine, and in Untying the Apron: Daughters Remember Mothers of the Fifties. Interviews have been published in a number of anthologies and magazines, including an interview by Daphne Marlatt in "The Sharon Thesen Issue" of The Capilano Review (3:5), edited by Jenny Penberthy. Sharon has taught poetry workshops at a number of summer writing colonies, including the Banff Writing Studio, Echo Valley, the Whitehorse Poetry Festival, St. Peter's College, and the Spoke Literary Festival in Vernon, and for many years has informally mentored younger poets and writers. ?She has been asked to write endorsements and reviews of scores of books of poetry and prose. Over the years, she has organized dozens of readings and festschrifts for both Canadian and international poets. She has given readings at the International Festival of Authors in Toronto, the Vancouver Writers and Readers Festival, the Blue Metropolis Writers' Festival in Montreal, the New Zealand Writers' Festival in Wellington, NZ, and the University of Burgundy in Dijon, France. ? She is currently Professor Emerita of Creative Writing at UBC's Okanagan campus and teaches poetry workshops in Lake Country, BC.